Consecrated religious are very much in the mind of Pope Francis, he himself being a Jesuit. Last November he visited a contemplative monastery and spent time with the nuns. 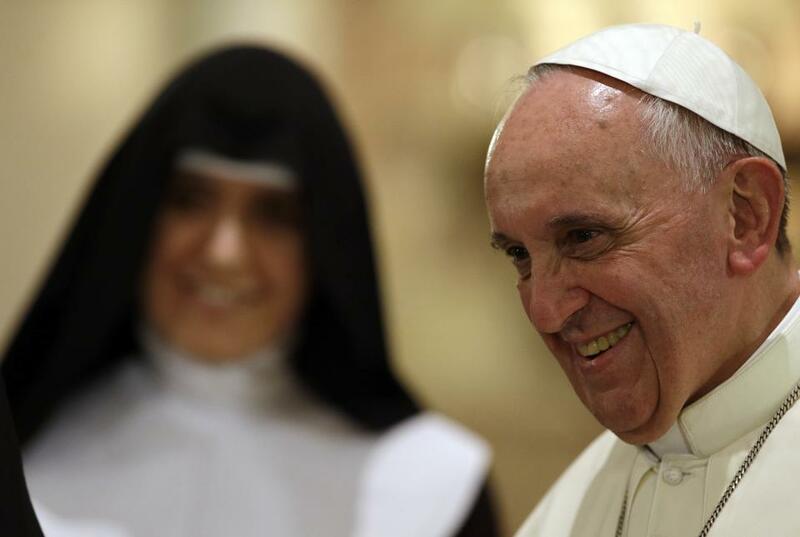 More recently, the media was abuzz when the Pope called a convent to wish the sisters a happy new year and was greeted by an answering machine instead (they were at prayer – thankfully he called back later). On Friday the Holy See unveiled the plans for a year dedicated to consecrated life, to begin this fall on the anniversary of the promulgation of Lumen Gentium. It is expected that Pope Francis will also promulgate a new apostolic constitution on religious life during this Year of Consecrated Life. Like Pope Pius V, a great reformer, whose tomb he visited the morning after his election, Pope Francis is very aware of the importance of clergy and religious in the life of the Church. He is committed to making sure that this beating heart of the Church is healthy and sound. Today is also a special anniversary for us. On this day in 2008 the Holy See granted us permission to make a new foundation in the archdiocese of San Antonio. We didn’t receive the letter until Feb 19th, but amidst the tears (they were both tears of joy and sadness – joy that God’s plan for us was being fulfilled, sad at the realization that we would soon leave our home and our sisters), as we saw the date on the envelope we marveled at God’s perfect timing. Today we celebrate the feast of the Presentation of Jesus in the temple. Today is also the Day of Consecrated Life, which recalls the importance for the Church of those who have received the vocation to follow Jesus closely along the path of the evangelical counsels. Today’s Gospel gives an account of how Mary and Joseph took Jesus to the temple 40 days after his birth to offer and consecrate him to God according to the prescription of the Jewish Law. This Gospel episode also constitutes an icon of the gift of their life made by those who, by a gift of God, assume the traits of Jesus as virgin, poor and obedient. This gift of ourselves to God regards every Christian because we are all consecrated to him through our baptism. We are all called to offer ourselves to the Father with Jesus and like Jesus, making a generous gift of our lives, in the family, at work, in service to the Church, in works of mercy. Nevertheless, such a consecration is lived in a special way by religious, by monks and by consecrated laypersons, who, with the profession of their vows, belong to God in a total and exclusive way. This belonging to the Lord permits those who live it in an authentic way to offer a special witness of the Gospel of the Kingdom of God. Totally consecrated to God, they are totally given to their brothers, to bring the light of Christ where the darkness is the most impenetrable and spread hope to discouraged hearts. Consecrated persons are a sign of God in the different spheres of life, they are the leaven for the growth of a just and fraternal society, they are a prophecy of sharing with the little ones and the poor. Thus understood and lived, the consecrated life appears to us as it really is: a gift of God, a gift of God to the Church, a gift of God to his People! Every consecrated person is a gift, a gift for the People of God on its journey. There is great need of these presences that reinforce and renew the commitment to spread the Gospel, Christian education, charity toward the neediest, contemplative prayer; the commitment to human formation, the spiritual formation of young people and of families; the commitment to justice and peace in the human family. But think about what would happen if there were no sisters in the hospitals, sisters in the missions, sisters in the schools. Think of a Church without sisters! You can’t. They are this gift, this leaven that moves the People of God forward. These are great women who consecrate their life to God, who advance the message of Jesus. The Church and the world need this witness of God’s love and mercy. The consecrated and religious are evidence that God is good and merciful. So, it is necessary to appreciate with gratitude the experiences of consecrated life and deepen our knowledge of the different charisms and spiritualities. We must pray that many young people answer “yes” to the Lord’s call to consecrate themselves totally to him in view of a disinterested service to their brothers, of consecrating their life to serve God and their brothers. For all these reasons, as it was just announced, next year will be dedicated in a special way to consecrated life. From this moment let us entrust this initiative to the intercession of the Virgin Mary and St. Joseph, who, as the parents of Jesus, were the first to be consecrated to him and to consecrate their life to him. This entry was posted in Jesus, Our Lady, Pope Francis, The Church and tagged consecrated, Feast of the Presentation, nuns, Pope Francis, religious, sisters, World Day of Consecrated Life, Year of Consecrated Life by texasnuns. Bookmark the permalink. Amen sisters! you are indeed a blessing to all of us who read your blog on a regular basis, and also to all the people you minister to in San Antonio, Texas! Thanks be to god for your work! thank you. sisters. a joyfilled message. Thank you so much for your kind words of encouragement! God’s grace is definitely working through the air waves, that’s for sure. He is so good to us, and our joy is a total gift from Him. Please pray for us and know that we are praying for you. We consecrated religious all depend on your prayers, and the prayers of everyone out there. We know that without that prayer support we couldn’t do what we do.